The tank mounted screw compressor is a newly-developed product. The screw air compressor mounted on air receiver will be more convenient to operete the equipment. The air compressor ensures high quality air without braeakdown and to have effective production. The robust design sustain functional process even in the higher temperatures like 55 ํC. 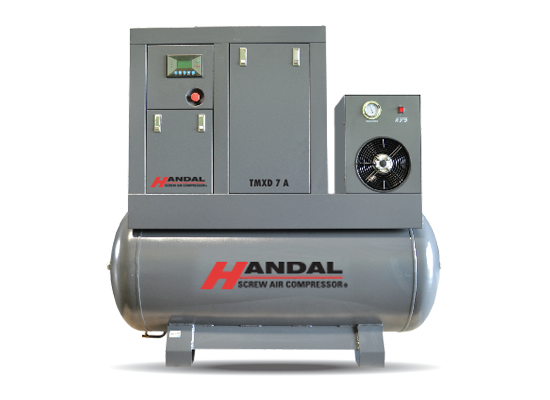 Handal tank mounted screw air compressor require less installation time and easy to maintain. 1. The air compressor indulges a rotary screw air-end that replaces an advanced rotor profile with slow rotor speed for their reliability. 2. Handal offer a simple plug-and-play solution with minimum hassle. The compact compressor design makes effective space uyilization and affordable. 3. The machine with a large air reciver tank is certified under ISO 9001 standards. 4. The highly efficient asymmetric rotor type screw guarantess an outstanding performance. 5. Potent noise reduction is achieved through a fully enclosed design, which restricts ambient machine sounds to below 62 dB. 6. The multi-function electronic controller comes with LED display and provides a user-friendly interface for ease of operation. 8. Handal offer 1 year warranty for the machine and a standalone 3 year warranty for the air-end. 9. In order to cater to consumers around the world, we provide a modified voltage service to ensure power conformity.